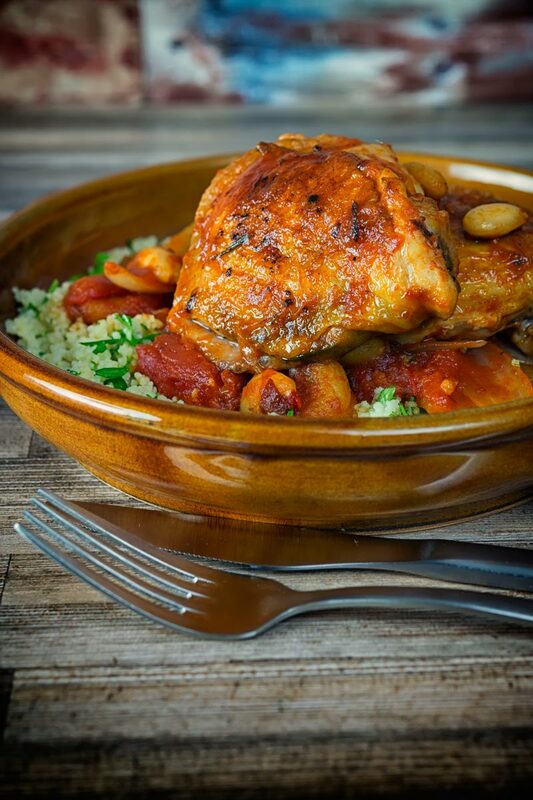 This simple Chicken Tagine recipe makes the most of the great flavour of chicken thighs and features dried apricots, almonds and a host of North African flavours. It is a delicious alternative to a chicken stew! 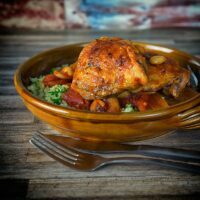 Chicken Tagine With Dried Apricots and Almonds. This chicken tagine recipe makes me come over all Julie Andrews, it contains so many of my favourite things! We have a little bit of heat of course from the chili… Then we have North African influences and fruit and nuts in a savoury recipe. Of course, there is the majesty of chicken thighs, without question the tastiest part of the chicken. I use chicken thighs all of the time, whether in curries or Chinese dishes like my General Tso’s chicken or Coconut Chicken Curry Recipe. 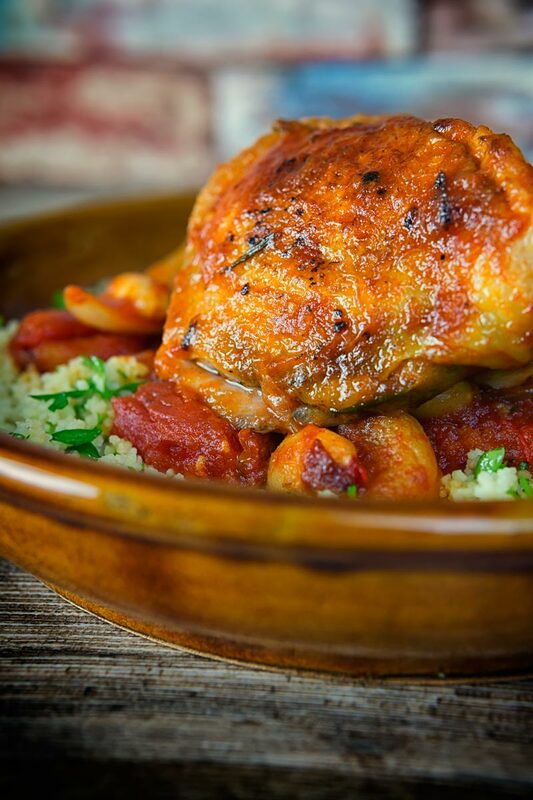 Or indeed, sticking with the North African theme in my Pomegranate Chicken Thigh Recipe! They are cheap to buy and stay really juicy and succulent when cooked making them my prefered choice of chicken! All of this is relatively slowly cooked down in a tomato-based sauce. It is a dish that is sweet, but not too sweet, sour, spicy and all sorts of comforting. It is also ridiculously simple to make, 10 minutes stirring and chopping then put your feet up until dinner time. 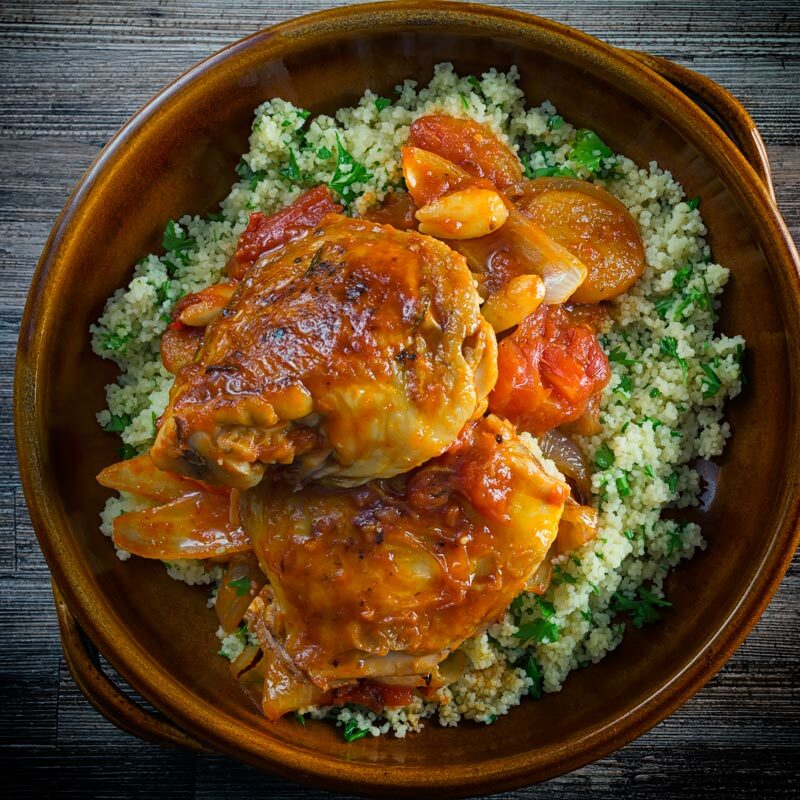 I serve this chicken tagine recipe on a bed of buttered couscous filled with parsley. Couscous are little rolled balls of semolina, usually made from durum wheat. Most of the couscous that we buy in the west has been pre-cooked. That means that it has been steamed and then dried again. As a result, it is really quick to prepare at home. All you need to do is add a hot liquid and cover with a tight fitting lid and it will plump up. I typically use stock when making couscous but water is more traditional. Here I add butter and parsley, but other options like pomegranate molasses, harissa or olive oil are all great ideas! Couscous has little flavour of its own but it is a great vehicle for other flavours. In this recipe, I have a boatload of flavour from the wonderful tomato sauce so keep it simple. But you can of course really go to town with couscous and turn it into a meal on its own as I do with my roasted vegetable couscous. A tagine is a Maghrebi dish dating back to the 9th century. It is named after the cooking pot it is traditionally cooked in. An earthenware pot with a conical lid that helps return all of the condensation to the dish being cooked. It has come to be a byword for a North African stew which is actually the Moroccan or Algerian version. The Tunisian version of a tagine is actually much closer to a frittata than a stew. I no longer use a traditional tagine pot… Not because I don’t like them but because I broke mine years ago and never replaced it. The secret to cooking a tagine in a pot without an earthenware tagine pot is a pan with a tight-fitting lid and not overfilling the pot. If you do not have a pan with a tight fittin glid then seal your pan with foil first and then add a lid! 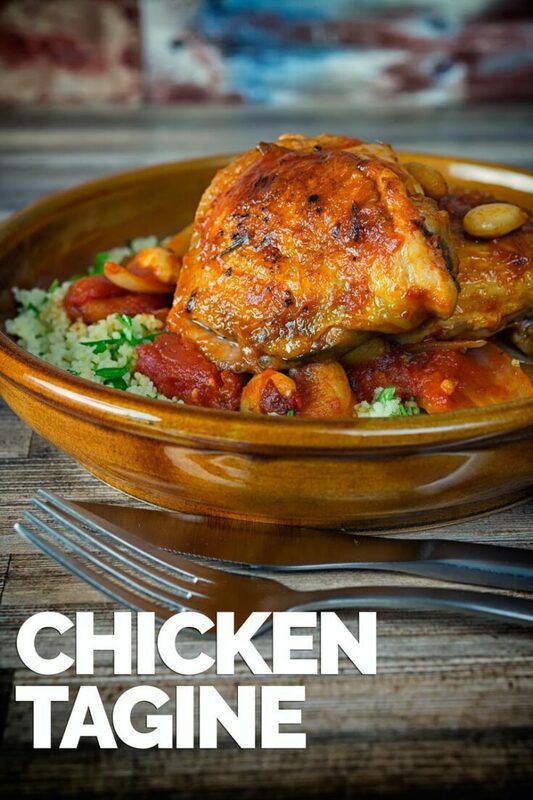 This simple Chicken Tagine recipe makes the most of the great flavour of chicken thighs and features dried apricots and almonds! Begin by preparing your vegetables, cut your onions into 8 wedges, peel and grate your ginger and deseed and finely chop your chili peppers. Heat a heavy based pan that has a tight-fitting lid over a medium-high heat. When hot add the butter and the oil followed by the onion, ginger, chili, cinnamon stick, and rosemary. Cook until the onion softens and becomes translucent, this should take 5-10 minutes. Push the onion and other ingredients to the side of the pan and then add the chicken to the pan, skin side down first, and cook until golden on both sides. Remove the chicken and place on a plate then add in the almonds, apricots, tomatoes, rose water, and honey and stir. Return the chicken to the pan along with any juices on the plate, reduce the heat to low add the lid and cook for 35-40 minutes. About 10 minutes before the chicken is cooked place the couscous in a bowl. Pour over hot stock and season with salt as required, this will very much depend on your stock. Drop in the butter and cover with a foil lid. Place in a warm oven until ready to serve. Just before serving fluff up to couscous and for through the parsley and use as a base for the chicken tagine. Sounds like this is such a flavorful dish! Love the addition of apricots in this. I’ve got to try this cooking method. i’ve never cooked in a tagine before, so I’m glad I can make recipes without having to buy one. I am loving all the wonderful flavors here! I am loving the twist of Dried Apricots and Almonds on your Chicken Tagine. 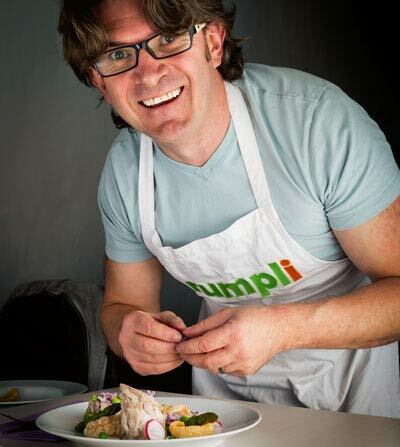 I love these ingredients in savoury dishes they work so well! What a delicious looking dish! Love that apricot flavor. Will be trying this soon! I love tagine and even have 2 tagine dishes I bought in Morocco. Sadly I rarely make it. This looks yummy. Gonna add it to my meal plan this week! Enjoy Jacqueline, I keep meaning to buy myself a new tagine pot but never get round to it.